There have been many horror movies about “things” that take over towns and cities. It could be a blob that has grown out of control or aliens that are taking over bodies. In order to build up the scares, that “thing” has to grow out of control. Do you have anything around your house that is out of control? Pets aside, it could be that your clutter has gotten so big that it is taking over your house. 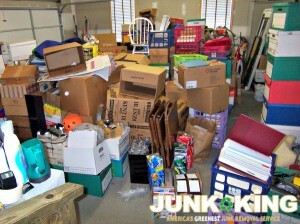 If you’re overrun by clutter, then it’s time to bring in the pros from Junk King Denver. Clutter can come in many forms. It can be all those outfits in your closet they you know you’re never going to wear again. It can be ugly sweaters, old coats, worn out shoes or hats that have seen better days. The common theme with closet clutter is that if it were to suddenly disappear you wouldn’t miss it one bit. What you would have is a lot more space in your closet for all the things that really matter. All of that closet clutter can be taken away by Junk King Dayton. What about your garage? How overrun by clutter are you out there? Before you move in you might have put up shelves for storage. Over time, those shelves filled up and now all the clutter as spilled onto the floors. Here’s where you’ll find sporting equipment that nobody uses, tools and appliances that are broken and electronics that have been replaced. Think about how your garage can be transformed if all that clutter were to suddenly disappear. It can with a little help from Junk King Dayton. Just because you’re down with your clutter doesn’t automatically mean it is trash. With Junk King Dayton on the job, all you unwanted clutter could be reused again by a local charity. Many of these organizations can make repairs or refinish old furniture. You don’t have to decide if your old stuff has value. The Junk King crews have been trained to pull out those items that can be donated or recycled. One session with Junk King Dayton is all it will take to make sure you’re not overrun by clutter. This entry was posted in Denver Junk Removal and tagged clutter, Junk King, junk removal on October 31, 2017 by Junk King. Last updated October 31, 2017 .